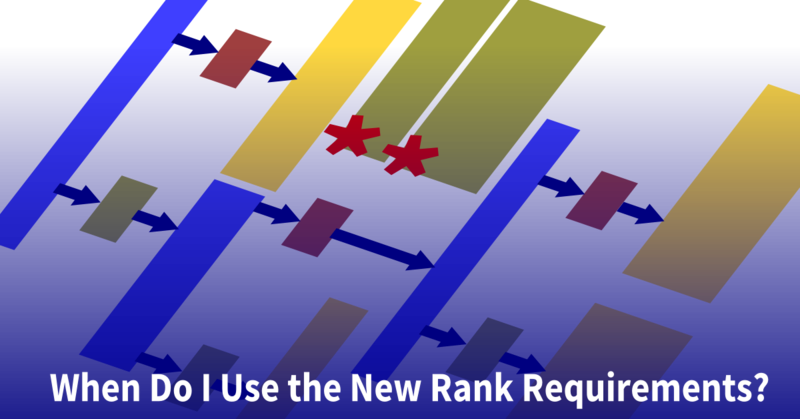 This is fifth in a series of posts about the new rank requirements that take effect on January 1, 2016. I’d note here that the “Scout Spirit” requirement for ranks has been used in the past to deny Scouts advancement when, in the opinion of adult volunteers, they fell short. Many times this denial has been capricious at best, and a personal vendetta at worst. I think it’s a good idea to ask a Scout to tell how they have done their duty to God, but I fear that it also introduces another opportunity to deny them advancement based on a conflicting interpretation or a set of undefined expectations. Rewording of the previous: “Earn six merit badges, including any four from the required list for Eagle.” I offer my reflections on merit badges below. Three changes: Venture patrol leader is removed from the list, the leadership project alternative is now described as Scoutmaster approved rather than assigned, and the addition of an option for lone Scouts. 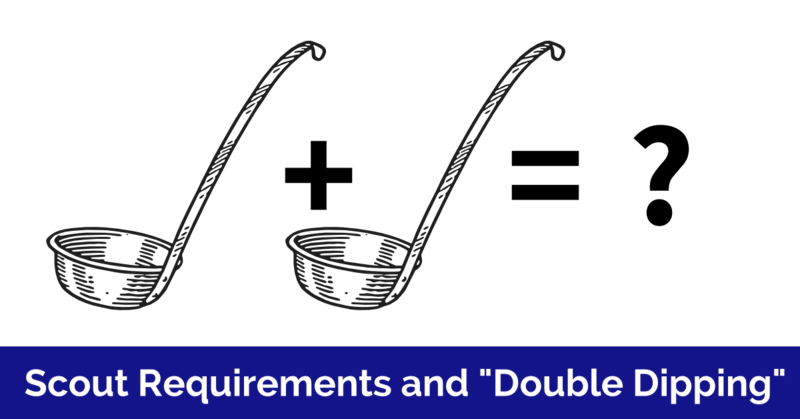 Requirement six is included in the BSA’s published parallel comparison of the new requirements. Is it a typo? It is identical to Scout rank requirement 6. It’s long been my belief there’s significant dissonance between the merit badge program and the experiences we promise our Scouts. Over thirty years I have counselled hundreds of Scouts in many different merit badges, and watched hundreds more earn badges. If I had a nickle for every completed blue card that passed through my hands I would be living on my own private island. Ask Scouts and they will tell you many merit badges required for Eagle are a huge diversion from the fun and excitement of Scouting. Each one of the hundred or so Scouts who earned Eagle during my tenure as a Scoutmaster have looked on many of these badges more as necessary evils than something consistent with why they are Scouts in the first place. I have also heard a lot of anxious talk about the mass Merit Badge events that have grown exponentially in the past decade. Oft expressed concerns over the thoroughness of instruction and the skill of counselors demanded the creation of a form to report such problems to a council advancement committee! That this, apparently, is such a pervasive problem it requires the creation of system of recording and reporting grievances ought to be a clear indication that something about the merit badge program is seriously flawed. None of this is the counselor’s fault, and none of this is the Scout’s fault, it is the fault of the way the badges are written, the expectations of adults, and an approach that has gone unchecked, unstudied, and unmodified. Instead of appealing to A Scout’s powerful drive to explore and discover their surroundings the requirements are so closely defined that they sap any excitement or engagement out of the work required. The experiments and observations are written with constraints that make them more perfunctory than exploratory. Nothing in the requirements is directly related to the outdoor activities Scouts do all the time or to the life of the patrol, and this is particularly frustrating when it would be so easy to do. Completing most of the requirements is, as is true with most badges, simply regurgitating the information found in the merit badge book. Eagle required badges are worthy subjects that we’d like Scouts to understand, but rather than encouraging investigation and experiences that develop understanding they are mostly a game aimed at finding predefined answers. Many Eagle required badges lack any connection to the life of the patrol, adventure, or the outdoors, they are boring and school-like. This is intensely frustrating because it would be so easy to make those connections. The merit badge worksheet; exercises that have Scouts fill in the blanks with easily obtained correct answers. Mass merit badge events where crowds of Scouts walk through a largely perfunctory program of filling in the right answers. If you listen to Scouts you will get the strong sense that they understand the system, find the right answer, fill in the blank, check off the requirement, get the badge, move on. Adults complain about ‘merit badge factories’, but our expectations create them! We don’t understand that our expectations define the shape of a camp program and drive the choices our Scouts make. We tend to select camps that offer as many different merit badges as possible, and the more Eagle required badges the better. This expectation makes the number of badges earned the way we evaluate a successful week at camp. As a camp director and staff member for many years we tried to create programs with lots of camping skills, adventure, and excitement but they inevitably drew few participants. Why the lack of interest? They did not result in a completed blue card. Engaging, interesting and exciting activities like pioneering, cooking, camping, hiking and other great outdoor pursuits aren’t acceptable activities in camp unless they are fulfilling some requirement or aimed at earning a merit badge. The exactingly close wording of the requirements, and the number of requirements for a given badge, gave us few opportunities to change the way they were presented. Large sessions (many with 30-50 Scouts), a corresponding drop in the ability of a counselor (or a team of counselors) to instruct Scouts personally or to be thorough in their evaluations. A big herd of disinterested Scouts looking for the easiest way to a blue card creates significant challenges to controlling their behavior. These perennial difficulties are not going to fix themselves, they are built in to the way we write badges and the adult expectations driving the program. 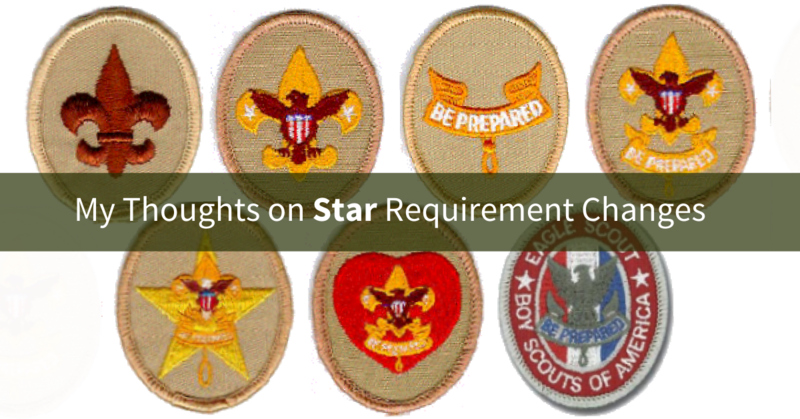 To address these difficulties we’d need to first change the way badges are written, and then reset our expectations for Eagle required Merit badges. 1. Requirements must have significant integration into the patrol method. Wherever possible badges should include activities conducted by the Scout with and for his patrol (well beyond ‘give a presentation about what you learned’). 2. Requirements must be integrated with camping activities in the out-of-doors. Few activities should require writing, and as many badges as possible should have at least one requirement that is completed while camping. If Scouts have to go camping to complete a badge that means they won’t be completed perfunctorily at a mass merit badge event. As they are presented now completing many requirements means simply regurgitating the information in the merit badge book. I’d introduce much more in the way of independent research and open-ended engagement. Simply recreating a list of definitions found printed in a merit badge book is not a representation that Scouts have learned or understood anything at all. 4. No badge has more than five, one line, core requirements. No nested lists of eighteen requirements, no “define these terms” requirements, no requirements that can only be completed with school-work. Creativity and innovation grows out of some sort of limiting factor, if you can’t communicate the introductory understanding of any subject in five requirements there’s a lack of focus and creativity in communicating..
5. All badges require a Scout-designed project rather than a pre-defined project. A universal requirement for all badges “Complete a project defined in consultation with your Counselor that demonstrates your understating of…”. Even when badges include a list of “do one of the following” the choices are defined too closely. There’s no way that such a requirement can be the right tool for every Scout’s location, abilities, or (most importantly) their interests. Once we re-wrote the badges here’s how I would re-write Eagle requirement 3, (and change Star and life requirements accordingly). I would arrange badges into five groups. Each group would have one required badge and a number of alternatives to choose from. Scouts choose from the alternatives in each group according to their interests and local conditions. I think Scouts would be much more invested in badges they get to choose rather than a long list of ones that are specifically required. Earn the five required badges, and two of the alternative badges from each group for a total of fifteen. Five Merit badges of your choice. You assert that the flaws you perceive are not the counselor’s fault. I feel that the quality of the MB experience is only as good as the MB counselors make it. If a counselor decides to interpret a “describe x” requirement as meaning write a definition in a workbook, then shame on that counselor for being so lazy. A “Demonstrate y” requirement means I need to see the Scout do the skill. And is it really hard to understand that a “Do the following” requirement that the counselor needs to see or have appropriate and permissible documentation it was done? I do agree that the MB Weekend or Factory or University approach is an abomination. I’ve seen Scouts come back from a half-day event telling me they earned Cooking or First Aid merit badges. Knowing that they did little to no individual work on requirements prior to going, I know something has gone amiss. But the system as it is means we have to accept the blue card if a qualified MB counselor signed it as completed. I do like your idea for a “Core 15” structure. While agree in principal with some of your other ideas above, as a First Aid instructor for a couple of safety agencies and MB counselor, I am very skeptical how you would reduce First Aid MB down to five one-line requirements and still cover anywhere near the breadth of skills and knowledge the MB currently covers. My MB class syllabus requires an average of 10 hours of “class” time that varies only slightly based on the participants. The time is spent in a mixture of lecture (15%), videos (10%), demonstration (25%), and guided hands-on skills (50%). There are about 60 specific requirements to earn this badge when you break everything down to the actual detailed items. Does every Scout that does First Aid or any given merit badge for that matter really WANT to do the badge? Of course not. Some will only earn a badge because it’s required. But hopefully they come away from completing an Eagle required badge having learned something that better prepares him for life. “I am very skeptical how you would reduce First Aid MB down to five one-line requirements and still cover anywhere near the breadth of skills and knowledge the MB currently covers.” Reducing it to fewer requirements would give counselors and Scouts the opportunity to shape the experience individually, not the scope of what is learned. I like a lot of the ideas about the MB program, but we would have issues in my son’s troop if each MB required some type of patrol activity. In the 2 1/2 years my son has been in the troop, there has not been one campout where there was any emphasis on completing a MB. It was all about Scout skills & rank advancement. We did a canoe trip with a qualified MB Counselor, but didn’t work on the Canoeing MB. We did a “Wilderness Survival” campout, but didn’t work on the Wilderness Survival campout. There has only been 1 troop activity in those 2 1/2 years directed at a MB. A troop alumnus, now a CNN producer, came home for Christmas to visit his family. The troop held a lock-in at the VFW in early January where they earned the Cinematography (now Movie Making) MB. 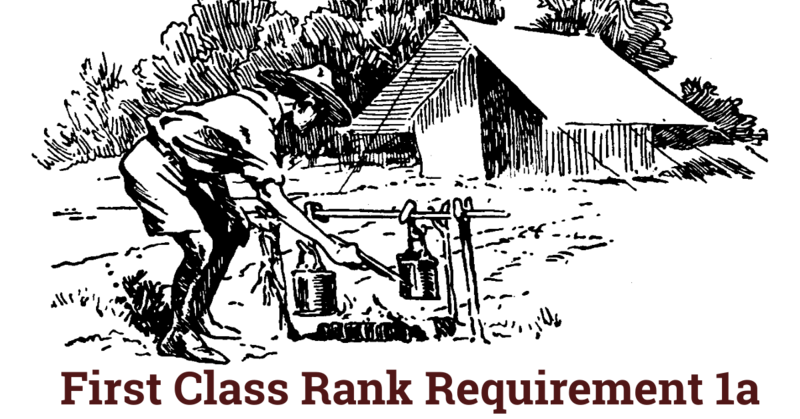 Scouts can complete MB requirements on a campout, but they are on their own to do it. My son needed to emcee a campfire program for the Communications MB. He had to go to the SPL 3 or 4 months in a row before they let him do it. Our troop’s campouts would really need to change if there became a patrol/troop focus on working on MBs. I am not suggesting that patrols and troops work on merit badges together, I would actively discourage doing that. What I suggest is that the requirements should be written so some requirements can be fulfilled in the context of a patrol (not a troop) activity. Just got back from summer camp. I take photos of the scouts at camp and publish them on our troop’s Facebook page each morning. The parents love to log on in the morning and see what their son was up to yesterday. The problem is I go around to the different merit badge classes and all I see is a bunch of boys sitting at a table with worksheets in front of them, listening to the counselor. I went to the camping merit badge class and that is what I saw. I told the class and counselor I would bring in my MSR reactor stove so the scouts could see a backpacking stove in action versus just discussing it. Had the scouts time how fast it could boil water. Made for a better exchange of information. I rather post pictures of the scouts in action, versus sitting there. 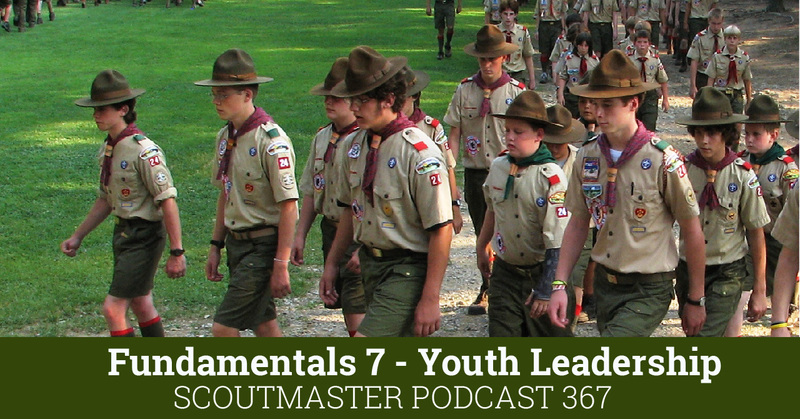 Scouts take the “required” merit badges at camp so they can get them out of the way. My opinion is to take the badges you can not do outside of camp – like rifle, shotgun, kayaking, small boat sailing, archery, climbing, etc…Communications can be done at troop meetings. Bring back the fun of going to camp and the fun of Scouting. Would a scout remember many years later climbing up the tower or defining the terms population, community, ecosystems, biosphere from Environmental Science? I agree. 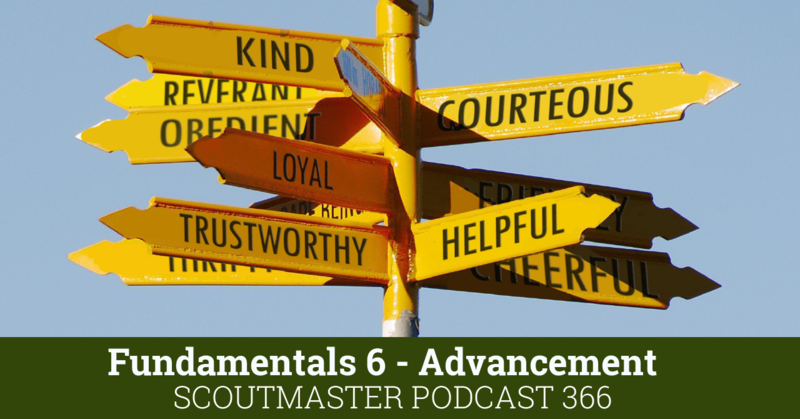 We need to go back to basics in Scouting. I think that Swimming, First Aid, Camping, Citizenship in the Nation, and any of the many sporting badges should be the core of Eagle required badges. I would create a new badge for Environmental Appreciation. Then add on a dozen or 15 electives. Boys should be able to have more fun at camp. I hate seeing boys sitting down at camp – except to eat. They should be kayaking, swimming, hiking, backpacking, climbing, etc.